There are 26 miles of protected inlet with 13 river drainages many with bays. Each drainage holds a unique ecosystem that can be explored. The Tenakee Inlet offers super-smooth waters for kayaking, which are available at the lodge. We are the local dealer for NuCanoe. The kayaks that we provide are actually hybrids between a canoe and a kayak, so they are very stable. We also provide hydraphones that you may drop over the side of the kayak into the water, allowing you to listen whale song, which is an enchanting experience. Our NuCanoe boats enable you to truly get "up close and personal" with whales, sea lions, seals and eagles. Don't worry, no one has ever been eaten by a whale or taken off by an eagle. Brown Bears are the largest animals you will encounter on land. Whales at sea. You can be with both of them the same day in your kayak. We have the safest sit on top kayaks. These kayaks are so stable you can actually stand up and fly fish if you choose. They are also equipped with rod holders and can be configured in many ways for passengers or equipment. These can be rented on there own. Guides are recommended with the number of bears around if you are planning on camping. We also have a full support boat that can provide you with anything from supplies to hot meals. 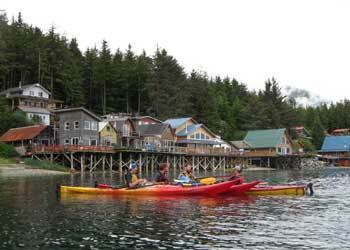 We can drop you and the kayak off anywhere in the inlet and pick you up or you can paddle back to Tenakee. Instruction in basic kayaking will also be available.